ARM STRENGTH: For seven years, Monica Løkken from the town of Vinstra had tendonitis in her arms and had to be retrained. 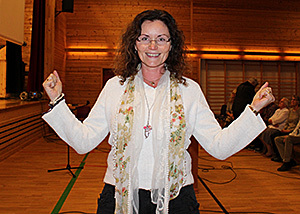 In 2008, she was instantly healed and given new strength in her arms. The picture was taken from a meeting in Heidal October 12, 2013, where she told her story. In 1993, Monica (43) graduated as a chef. She began working in the kitchen at a mountain hotel and enjoyed it. After a while she started to get pain in her wrist, forearm and elbow. -The pain kept increasing. I went to the doctor and got pills while I also used a support bandage and received treatments from a physiotherapist. It did not help much, and the pain would not go away. Gradually it evolved into becoming chronic. Løkken tells about the pain being great, and that it hurt all the time. At night she had to sleep with her arms in a specific angle so she would not be in too much pain. Her job as a chef was also very challenging. She was on active sick leave and went regularly for treatments. On a few occasions I dropped a few pots to the floor, because I had no strength in my arms. Fortunately there was no hot food in the pans. When it was at its worst, I could not lift a cup of coffee during the lunch break at work. Then there was no other choice than to go home, she says seriously. After a long period of sick leave, Monica made the decision to re-educate herself. She chose to become a chef teacher instead, which would partly reduce the strain on her arms. -I became somewhat better, but I had to constantly use a support bandage and take breaks from work. In 2008 Svein-Magne Pedersen was going to have a meeting at Thon Hotel in the smaller city of Ski. Løkken decided to attend the meeting. When Pedersen prayed for her, she felt prickling in the palm of her hand. -When I sat down in the audience again, I noticed that the pain was gone. I was so happy, Monica says. A few days later she was moving into a new house.There was a lot of work to do and a number of things were to be packed and transported. In addition, both houses were to be washed down, which was a demanding job. -I felt a tremendous strength in my arms and worked like never before. All day I carried heavy boxes filled with books up a steep hill to the house, and up to the second floor. My arms were perfectly healthy. Later I washed both houses problem free. I am forever grateful for what has happened. Five years have gone by now, and I have never had any more tendonitis.